Solasodine is an antioxidant glycoalkaloid of Solanum species. 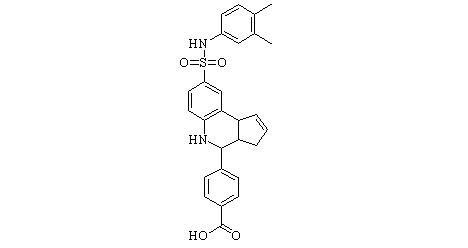 HDM201 is an orally bioavailable human double minute 2 homolog (HDM2) inhibitor with potential antineoplastic activity. 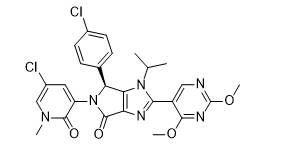 AA-115, also known as APG-115, is a highly potent, chemically stable and efficacious MDM2 inhibitor, which has entered clinical development for cancer treatment. Parthenolide is an NF-κB inhibitor, reduces histone deacetylase 1 (HDAC-1) and DNA methyltransferase 1 independent of NF-κB inhibition. BH3I-1 is a Bcl-2 antagonist. BH3I-1 has a Kd of 5.3 μM against the p53/MDM2 pair. 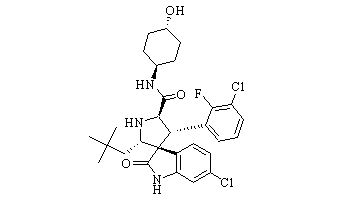 RO8994 is a highly potent and selective series of spiroindolinone small-molecule MDM2 inhibitor. MX69 is the MDM2/XIAP inhibitor, used for cancer treatment. 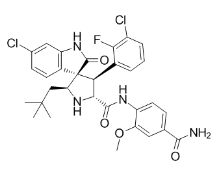 SAR405838 is a highly potent and selective MDM2 inhibitor, binds to MDM2 with Ki= 0.88 nM and has high specificity over other proteins.